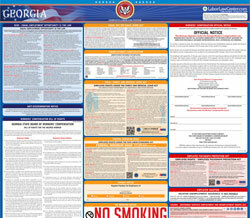 The Unemployment Insurance for Employees is an unemployment law poster by the Georgia Department Of Labor. This is a mandatory posting for all employers in Georgia, and businesses who fail to comply may be subject to fines or sanctions. This poster must be posted in a conspicuous place where all employees will see it. This poster describes the laws for unemployment insurance for employees. It appears you don't have a PDF plugin for this browser. Please see the link below to download georgia-dol810.pdf. Your job with this employer is covered by the Employment Security Law. your own and comply with all requirements. GEORGIA DEPARTMENT OF LABOR  GDOL  CAREER CENTER LISTED BELOW. and be willing to immediately accept suitable work. Register for employment services with the Georgia Department of Labor.